Monitoring search trends and hot topics for keyword targeting and content ideas is a common practice among publishers these days. While this pollutes the search results when taken to the extreme (see below), done right it is an effective editorial SEO tactic. The Hot Searches on Google Trends tend to be dominated by topics like sports, politics and entertainment with frequent breaking news and stories that attract a lot of attention. It is also common to see terms that suddenly enter the popular consciousness for one reason or another. For publishers that focus on evergreen content such as lifestyle topics the available trend data is much more limited. But that doesn’t mean that opportunities never arise. I’m not sure what drove the sudden spike in search activity around “polenta” but it is a perfect fit for sites that cover recipes, cooking and food-oriented topics. It doesn’t take trend tools to realize that pumpkin carving searches rise sharply around Halloween. But monitoring these tools also provides insight into exactly how users are searching around a particular topic (right now as opposed to historically). That offers an immediate and actionable optimization opportunity. So regardless of your area of coverage, it pays to keep an eye on trending topics. Search trend and social media data is useful for optimizing specific pieces, developing new content ideas and ongoing editorial planning. For more ways to track activity, see my post on Free Tools for Monitoring Hot Search Trends. 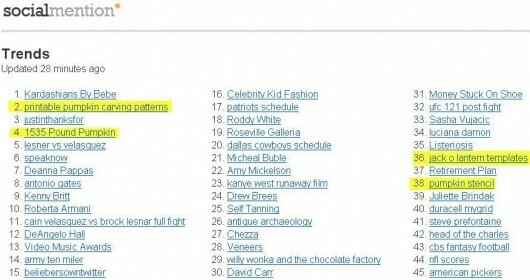 And don’t forget to identify your own top trends by looking at your internal data. That all sounds great, but unfortunately reputable content sites are not the only ones employing these tactics. There are a growing number of sites that pump out low-quality, ad-heavy articles targeting whatever search terms happen to be trending that day. Amazingly some qualify as Google News sources which enables them to secure high placement for popular searches via embedded news results. 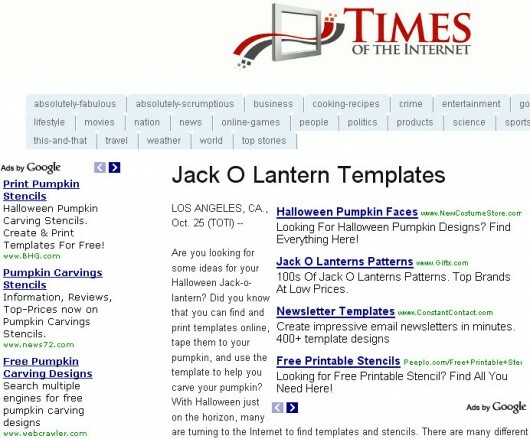 Do these articles offer users what they were looking for, actual pumpkin carving patterns and templates? In going through 6-8 embedded news results in most cases the answer was no. 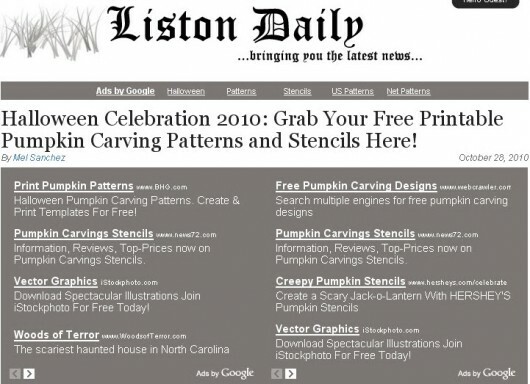 The Liston Daily article does have some (rather small) carving templates at the bottom of their article, but the headline and the giant block of ads at the top seems to reveal their motivation in creating it. 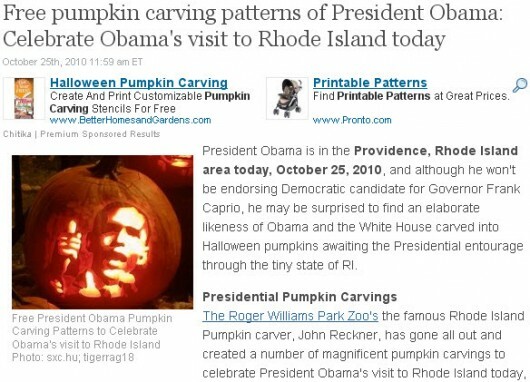 Interestingly the Examiner article appears to be going after both the “pumpkin carving pattern” search trend and the spike in searches around President Obama’s visit to Rhode Island. I can’t imagine Google is happy with the quality of these embedded news results and they certainly don’t want it to be this easy to game Google News. But it happens quite a bit. To be clear it is not just evergreen content that is affected; Google News manipulation happens every day in all kinds of subject areas. But since there is less news content around lifestyle topics and many reputable lifestyle sites do not qualify as Google News sources the bad examples tend to get prominent placement more easily. The good news is that manipulative practices and poor quality results do tend to eventually get weeded out. 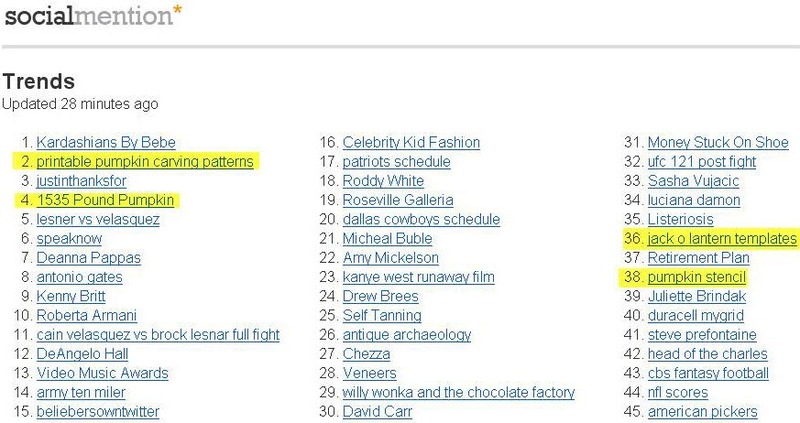 And the main Web search results are typically fairly good for evergreen content searches (trending or otherwise). So don’t get discouraged; there is plenty of upside for sites that produce quality, relevant content on things like seasonal lifestyle topics. Google Trends Graphs No Longer Embedded in Search Results?